This week is OCP Summit 2018, and I cannot think of a better time to do a status update on our Open Source fabric powering our cloud. Since joining OCP back in 2014, I have always been a huge supporter of Microsoft’s participation in the important work done by the members of the Open Compute Project (OCP) community. The idea of tech industry leaders coming together around a common goal to innovate and improve on existing technology through the sharing of knowledge, creates a huge impact on the world and is a great way to learn and grow. Only through the constant innovation across, not just our customer facing services, but the very base-layers of what makes up our global infrastructure, are we able to control our own destiny. SONiC is the default switch OS powering Azure and many other parts of the Microsoft Cloud. Since last year’s Summit, we have grown its footprint substantially and are now also powering services such as our AI platform, making sure researches have the very best experience when working on solving some of the world’s most pressing problems. This year’s milestones are a testament to our open and community driven approach and why that ultimately leads to great technology innovation and consistently improved performance. Both things that pay back our customers through the best platform experience possible. SONiC and its sibling Switch Abstraction Interface (SAI) are both heavily rooted with our industry ecosystem. Since the inception three years ago and the subsequent open sourcing we have been growing industry support and number of contributing partners rapidly. Over the past year, we have welcomed many new industry leaders to the SONiC/SAI family. At the OCP Summit two years ago, we revealed our groundbreaking network switching software called SONiC, short for Software for Open Networking in the Cloud - a container based, open-sourced switch OS architecture. Built for cloud-scale performance and resiliency. We showcased how SONiC’s container-based design accelerated development and allowed for cherry-picking the very best building blocks when designing and deploying cloud-scale networking infrastructure. High reliability and hitless serviceability ultimately translates into great customer satisfaction! adding to this already rich eco-system focused on chip/ASIC support and integration through SAI, Cisco and Innovium have joined their peer chip innovators in the community. Along with industry support and recognition, comes technology width and versatility. Building performant large-scale networks across multiple switch topologies can be extremely challenging and cumbersome. This is why broad chip/ASIC support is at the very heart of what SONiC/SAI was built to do. Developers across the world are contributing to SONiC, refining and adding new capabilities. In the past 12 months, the SONiC community has delivered three official releases. All these milestones have greatly enriched and increased SONiC use-cases. I would like to thank new and existing members; Alibaba, Mellanox and Tencent for their contributions and hard work on VLAN trunking, Remote Direct Memory Access (RDMA) and Virtual Routing and Forwarding (VRF), as well as LinkedIn for their persistent push towards decoupling network hardware and software through alignment with their project Falco – efforts that has been active since 2014. Spanning from low to high-end, fixed pipeline to highly programmable, 1Gbps to 400 Gbps, multiple power efficiency profiles, table sizes and telemetry capabilities SONiC/SAI will provide a perfect foundation for users looking to use SONiC as their switch OS of choice. Microsoft is all about providing users with options and choice of direction. I am therefore thrilled to also see the number of Original Design Manufactures (ODM), also known as whitebox vendors, supporting SONiC doubling over this past year - a trend we expect to continue with even greater velocity. 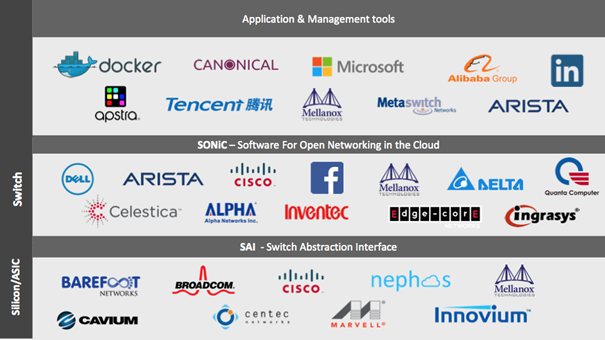 Delta Networks Inc, Quanta Computer, Celestica, Inventec and Alpha Networks, have all joined the SONiC coalition in addition to our existing members for whom SONiC is the switch OS of choice for their latest offerings, as well as future technologies. Today at the OCP Summit, Apstra announced a turn-key solution for SONiC. This will provide users an easy path to adopt and start taking advantage of SONiC in their own environments. Offering turnkey support, the Apstra offering will fill the requirements of enterprise customers looking for additional assistance to get everything on rails. “Today at OCP Summit 2018, we're showing a demonstration of AOS® with SONiC, a container-based cloud networking stack open sourced by Microsoft, along with Mellanox hardware that represents the increased demand for our multi-vendor Intent-Based Networking solution." said Mansour Karam, CEO and founder of Apstra. SONiC is marching beyond single ASIC devices. During OCP, Arista demonstrated how SONiC can now manage a modular chassis using their EOS SAI App, showing SONiC for the first time controlling a modular chassis forwarding plane. While Marvell has enabled SONiC on an ARM based switch, providing even richer options for users in the future. Innovation, whether acting on that brilliant idea from the back of the room, creating or being swayed by market trends or learning from our smart competitors, open source communities remain a constant for me and Microsoft’s path forward. Lastly, welcome all our new members and contributors and an extended invite to all our industry peers to join us building out SONiC. Read more on SONiC, how we build our global network and Azure’s open approach to networking.